Democrats shaped a set of principles Saturday that commits the party to guaranteed health care for all, heading off a potentially divisive debate and edging the party closer to the position of Barack Obama's defeated rival, Hillary Rodham Clinton. The party's platform committee moved smoothly through a range of issues for the fall campaign and approved a document that will go to the Democratic convention in Denver later this month for adoption. There was little dissent - or room for it - in the day's meeting and a compromise on health policy took one flash-point off the table. 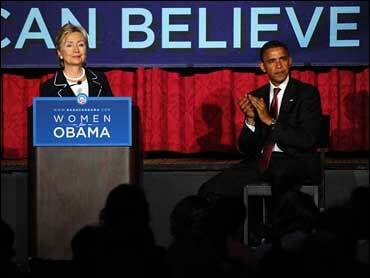 Obama, soon to be the Democratic nominee, has stopped short of proposing to mandate health coverage for all. He aims to achieve something close to universal coverage by making insurance more affordable and helping struggling families pay for it. Advisers to Obama and Clinton both told the party's platform meeting they were happy with the compromise, adopted without opposition or without explanation as to how health care would be guaranteed. In return for the guarantee, activists dropped a tougher platform amendment seeking a government-run, single-payer system and another amendment explicitly holding out Clinton's plan as the one to follow. The party now declares itself "united behind a commitment that every American man, woman and child be guaranteed to have affordable, comprehensive health care." Under any system in play, most people would still put out money for health insurance as they do now, but they would get help when needed. That was a common feature of the plans put forward by Obama and Clinton in the primaries. But she would have required everyone to get insurance while his plan makes it mandatory only for children. Democratic Party Chairman Howard Dean praised "the spirit of this compromise." Judith McHale, a Clinton supporter who helped to lead the platform meeting, said Obama and Clinton advisers worked collegially throughout the process. For the 186-member platform committee, one imperative Saturday was to satisfy Clinton loyalists still sore from the often acrimonious primary fight while keeping policy firmly in synch with Obama's campaign. Democrats made mostly cosmetic changes to a platform draft prepared for the meeting, a process designed to showcase unity more than to air differences in the party at large on hot-button issues such as the Iraq war, abortion and health care. Party platforms are a statement of principles that are not binding on the candidates or the next president and they are typically given little attention after they are adopted. Even so, the party's decision to embrace guaranteed health care is bound to become a leading yardstick by which Obama's presidency will be measured if he wins in November. On Iraq, the platform states that Democrats "expect to complete redeployment within 16 months," reflecting Obama's time frame but not the tone of certainty he brought to it when he was running in the primaries. The 51-page platform draft showed the influence of Clinton's supporters not only in the extensive section on health care but in its assertions about the treatment of women. Some of her backers believed sexism dogged her campaign for the nomination. An extensive section on women's rights is included and the votes she received in the primaries are described as "18 million cracks in the highest glass ceiling." Even so, the platform is thoroughly tuned to Obama's proposals. It reasserts his promise of energy rebates to struggling families, pension subsidies, a crackdown on predatory lenders, higher taxes for families earning over $250,000, tax breaks for others, billions for economic stimulus and "direct high-level diplomacy, without preconditions," in the case of Iran. On trade, it promises a multilateral approach to improving the North American Free Trade Agreement, without saying specifically what those changes should be. Obama criticized NAFTA when campaigning in states that felt disadvantaged by it, but the platform offers no suggestion he would take unilateral action against the deal. Instead, it says: "We will work with Canada and Mexico to amend the North American Free Trade Agreement so that it works better for all three North American countries." Democrats typically have a strong plank in favor of abortion rights; this year's version is stronger than usual. "The Democratic Party strongly and unequivocally supports Roe v. Wade and a woman's right to choose a safe and legal abortion, regardless of ability to pay, and we oppose any and all efforts to weaken or undermine that right," it says. Gone is the phrase from the past that abortions should be safe, legal and "rare." The party also pledges to ensure access to adoption programs, prenatal and postnatal care and income support programs for expectant mothers who need the help. Promises "tough, practical, and humane immigration reform in the first year of the next administration." Favors restoration of the ban on assault-type weapons and other "reasonable regulation" that recognizes the constitutional right to own and use firearms. Favors helping religious groups provide social services as long as "public funds are not used to proselytize or discriminate." Promises to close the Guantanamo detention center. Promises to double the Peace Corps.